Industrial IoT solutions, at their most fundemental level, derive their value by connecting sensors and smart devices to gain real-time visibility on assets and operations. In order to accelerate IoT value creation, our EASE-V8™ IoT Platform integrates a powerful plug-n-play visual IoT digital twin to emulate real devices on the shop floor, we call it EdgeViewTM. IoT Smart Infrastructures™ are built on micro-services ( Edgelets™) that can immediately demonstrate their business benefits by conecting IoT devices on the EdgeViewTM digital twin environment. Complete operational work flows and use-cases can be run on EdgeViewTM IoT digital twin, enabling complete IoT service creation with real world smart devices on your desktop, reducing costs and risks associated with purchasing vendor specific hardware. These EdgeView™ virtual devices provide all the required device data and sensor events to develop, test and deploy complete IoT solutions from inception to deployment, as if the actual hardware were installed on your operations floor. Furthermore, specific workflows can be executed and recorded on EdgeView™. 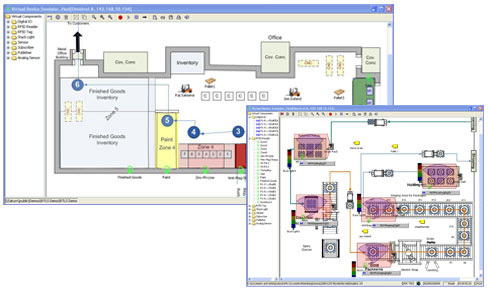 These workflows can then be run simultaneously using one or more instances of EdgeView™ to validate and observe real world behavior that will be encountered in production. EdgeView™ provides a powerful emulation tool for integrating external devices, SCADA/PLC controllers, RFID readers, sensors, analog/digital devices, stack-lights, and more to build and showcase Smart Infrastructure™ benefits of IoT in your specific operations. Visual digital twin for actual sensors and IoT devices. Dragand drop IoT devices to closely emulate your IoT-driven operations floor. Collaborate on development, testing and demos between sales, customers, and engineering. Reduce risks, costs and accelerate proof-of-concepts for complex sensor-based deployments. Publish external events from any device source without hardware. Test single or multi-site deployments on your desktop. Record and playback for test automation. Troubleshoot services leveraging EdgeView™ virtual devices with actual hardware. Multiple EdgeView™ instances for robustness and performance testing. Powerful sales demonstration tool to showcase IoT over webinar presentations.